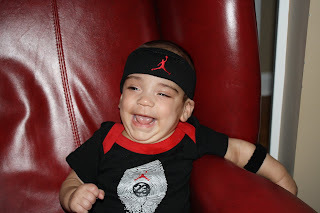 For those of you who don't know my husband, he looooves Michael Jordan...and I mean loooooooves him! 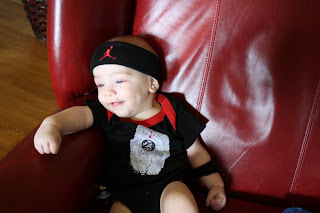 I think he has every game that Jordan has ever played and he never gets tired of watching them(must be a guy thing). 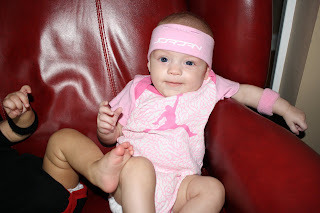 So for one of our baby shower gifts, Jackson's mom and dad gave us Jordan outfits for the trips. Jackson's mom came over the day and we had a blast taking pictures of them in their outfits, and I had to share. 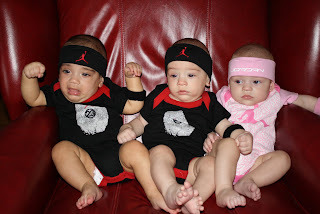 The onesies came with little hats and socks, but they were too small, so I improvised making headbands with the hats and wristbands with the socks. Hope these crack you up as much as they did us! 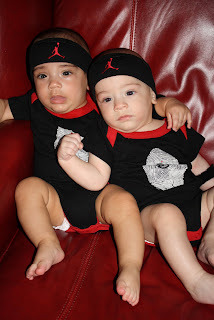 My babies are 4 months old, and time is flying by! Things have changed so much since the last time I blogged (shocker). First of all...Laid Back Jack is laid back no more! It was like he has woken up all the sudden. I guess he said, "I've been quiet long enough, now I'm going to be heard!" He is the loudest screamer and he talks the most. 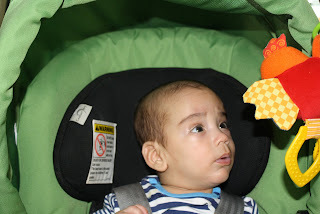 He is constantly cooing and jibbering. I can already tell that he is going to keep us on our toes and have us laughing all the time. He is quite the character. He can go from a complete screaming fit to laughing his head off. Gabe is still a Mama's boy, but really loves his Daddy too. He wants to be able to see Jackson when he's holding him, and smiles at him all the time. He's starting to develop a cute personality. He is all smiles now, especially in the mornings. But when he's ready for a bottle, look out. That boy can eat! He's pretty quiet when it comes to talking. He's got the softest little voice. Little Miss Isabella may be the sweetest baby in the world! Well, of course I think they're all sweet, but she is an angel! She is all smiles all the time! 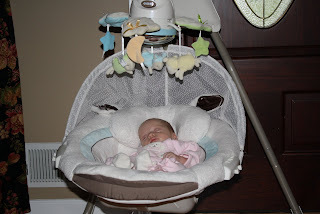 The only time that baby is fussy is when her reflux is acting up or when she is sleepy. She loooves this little stuffed octopus that she talks to all the time. I think I'm starting to see a light at the end of the tunnel. They still aren't sleeping through the night, but it's getting better. 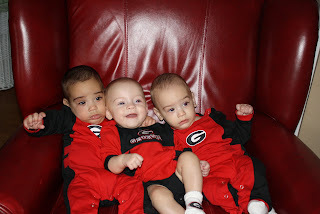 I still haven't let them cry themselves to sleep yet, but I guess that's coming soon. The doctor said that three nights should do it. Ugh, I'll try. We had to move Isabella to her own room, and it seems to be working out pretty well. She didn't move to her big girl crib as soon as the boys did, so she didn't really get used to being in the room with them. So, for now, she has her own girlie room where she and her Weez sleep(Weez is my mom for those of you who don't know). Weez sleeps in her room because Isabella still has choking issues. 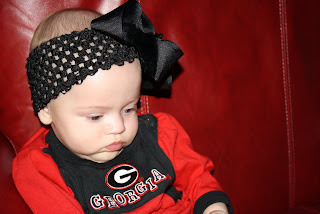 Her reflux makes her spit up a lot, and sometimes she chokes and needs help. I don't even want to imagine what would have happened if she wouldn't have had mom in there with her. So yes, my mom is still staying with us. And for all of you who ask why, I invite you to come spend 24 hours with me, and then I think you will understand. 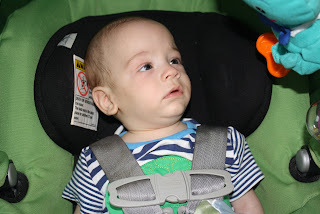 The babies had their first physical and occupational therapy session a few weeks ago, and it went really well. Gabe even rolled over for the first time! Show off! 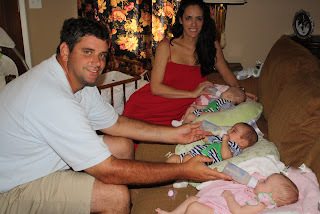 They gave us some exercises to do at home, and Jack and Isabella go back at 6 months. Gabe is scheduled to go once a month because he has "high tone." From what I understand, that means that his muscles are a little tight and he needs just a little more work. 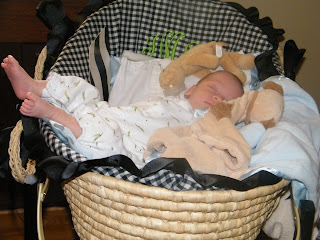 So, we do our stretches with every diaper change, and we'll go back this month to see how he's progressed. I still look at my babies and can't believe what miracles they are and how incredibly blessed we have been. They are all doing so great, and amaze me everyday. Even though it's a lot of work, they are so much fun. Here are a couple of pics from the last month. So that's about it in a nutshell. Any advice on getting my little ones to sleep through the night, or when it might happen would greatly be appreciated. 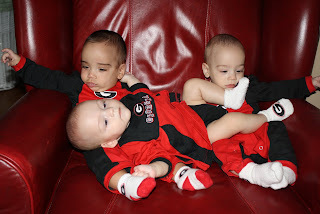 Well, gotta go......babies are calling! 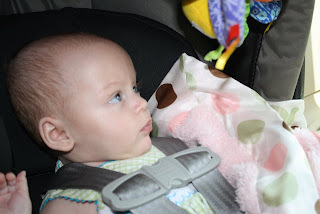 I can't believe my babies are 10 weeks old, and they are literally changing daily! They are really starting to develop very different personalities, and it's so fun to watch them interact with each other. Sweet Jack. Jack is my laid back baby. He could care less if the sun rises or sets, he's just happy to be in this world. As long as you feed him and change his diaper he is good. He's the one that will wait for the other two to have their bottles. I think he would sleep all day long if you would just give him his pacifier every once in a while. God knew what he was doing when he gave us Jack. Mama's Boy Gabe. Gabe has definately become a mama's boy lately(and that's fine with me!). He can get a little frantic at times, and all I have to do is walk up to him and he quiets down. He's also quite the snuggle bug. He loves to nuzzle in and go to sleep. And let me tell you, that is some good luvin!! Miss Priss Isabella. She is definately all girl. The little thing is the most high maintenance for sure. Put it this way, the nurses in the NICU said she came out spoiled. She loves human contact, and is already a little mess. She will fight you tooth and nail if she does not want her pacifier or if she is not ready to lay in her bed. Boy arewe going to have our hands full with that one. They are now all smiling at us, and that is the best feeling in the world. They're still eating every three hours, so sleep is minimal at the Michael house, but hopefully that will change sooner than later. 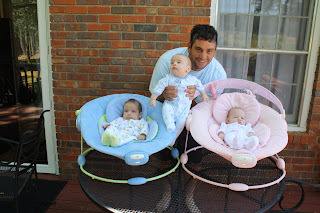 All three of them love their Little Lamb Cradle 'n Swing. Thank goodness, because they really don't like bouncey seats or anything like that. And don't even think about turning on any type of vibration for Gabe. He screams bloody murder. 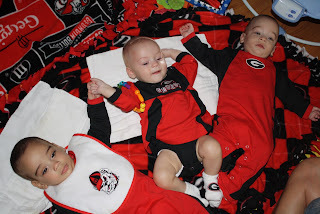 Another thing that seems to pek their interest is their Baby Einstien play mat. Mom and I ventured out of the house to Target last week. It was quite the side show. We got the typical questions that we were told we would. 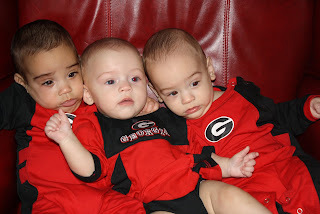 "Are they triplets?" The best one was, "Did you have them, or did you adopt them?" But at least everyone was nice. I went back to the doctor last week to get an IUD, and Dr. Leach got to hold them for the first time. We both still couldn't believe that all of them were in my belly 10 weeks ago. So that's about it. Mom and I are taking them to the doctor for their 2 month check-up tomorrow. Wish us luck. Three screaming babies...oh Lord! 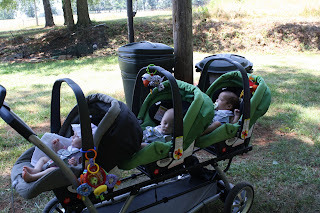 BTW.....to all of you mom's of multiples who blog on a regular basis...hat's off to you. Especially you Suzanne. How do you do it??? I'm trying to get better. Just wanted to share some fun pictures of the babies. It's amazing how much they are changing. I can't believe they're already 4 weeks old! Sweet Baby Jack. Check out how Jack & Isabella are mirroring each other. I'm such a terrible blogger. 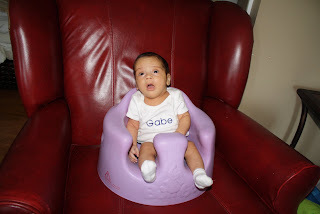 My sweet baby Gabe has been home since Saturday, and I'm just blogging about it. We're finally starting to settle in, so hopefully I'll get better at this. Praise God! All three of my babies are home! We were able to bring Gabe home Saturday. We had to bring him home on oxygen, but at least he's home. I have to admit, it has been a little overwhelming to bring a baby home hooked up to oxygen tank, but we're trying to adjust. I thought I was going to lose it after we got Gabe home. Besides the oxygen, they sent us home with a monitor that tells us his oxygen saturation. We're only supposed to do spot checks on him, but of course, I'm a little paranoid, so I wanted to leave it on him. About the time Gabe's monitor started alarming, Jack got choked. His little lips turned blue as he was trying to gasp for air. Luckily we got him under control, but we were still having trouble with Gabe's monitor. We called Gabe's favorite NICU nurse, Lisa, who gave us a couple tips, and Jackson seemed to get it figured out. I, on the other hand, just wanted to cry or run away, or both. This is such a scary time when they are this young, and I am so paranoid. Couldn't they just send a NICU nurse home with us until they were about three or four months old? :) Seriously, I've just heard stories of mom's finding their children not breathing, and it scares me to death. What if that happens and I don't know what to do? I'm so worried that I would freeze. I'm just praying that I don't ever have to go through that. Ok....I just had to get all of that off my chest. I know things could be much worse, and believe me, I know how incredibly blessed I am. Welcome Home Jack and Isabella!! 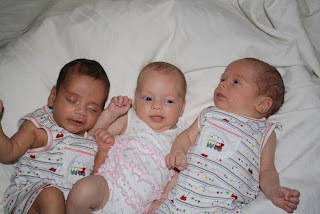 We were so blessed to bring home Jack and Isabella yesterday after spending 18 days in the NICU. My sweet little Gabe is still there because of some oxygen saturation issues that he is trying to work through. Yesterday was such a roller coaster of emotions for me(not that my emotions aren't enough of a roller coaster). On one hand, I couldn't be more thrilled that two of my babies were well enough to come home after only a 2 1/2 weeks, but on the other hand, I could hardly stand to leave one behind. We are so fortunate to have the best nurses taking care of our sweet baby. I know he is getting lots of hugs and getting extra spoiled, so that makes it a little easier. Gabe waving good-bye. See you soon brother and sister!! As for the two at home, they did great last night. My mom and Jackson's mom stayed up with them ALL NIGHT and watched them breathe so I could get some rest between feedings. Thank you!! So we survived the first night with two. Whew!! !